SAVANNAH, Ga., April 21, 2005 - In the first quarter of this year, Gulfstream Aerospace, a wholly owned subsidiary of General Dynamics (NYSE: GD), delivered four new special mission aircraft – one to the Japan Coast Guard (JCG), one to the U.S. Army, one to the U.S. Navy, and one to the National Center for Atmospheric Research. During the same quarter, Gulfstream also received an order from the German Aerospace Center for a G550 that will serve as an atmospheric research aircraft. "We are extremely pleased with the types of special mission aircraft we are developing," said Bryan Moss, president, Gulfstream. "When we deliver one of these aircraft, the customer receives an aircraft that not only meets their unique requirements, but also features the built-in reliability, high performance and award-winning product support for which Gulfstream aircraft are known throughout the world." Gulfstream delivered the first of two GV aircraft to the Japan Coast Guard January 17. Dubbed "Umi Washi" (translated: Sea Eagle), the aircraft will be operated by the JCG for maritime surveillance search and rescue. This second aircraft is scheduled for delivery in the second quarter of this year. The U.S. Army took delivery of the first ultra-long-range G550 aircraft in the U.S. government fleet on January 24. Less than a month later on February 18, the U.S. Navy took delivery of the U.S. government’s second G550. Designated C-37B, these high-performance aircraft will perform the vital mission of providing secure, priority transportation to high-level government and military officials worldwide. In addition to featuring the PlaneView™ cockpit and award-winning Gulfstream Enhanced Vision System™, the aircraft meet the government’s stringent mission communications requirements. The aircraft will be based at Andrews Air Force Base, Md., where they join a fleet of more than a dozen other special mission Gulfstream aircraft. Gulfstream’s Contract Logistics Support team based at Andrews AFB will maintain the aircraft to ensure they meet the government’s demanding mission-capable and dispatch rate requirements. 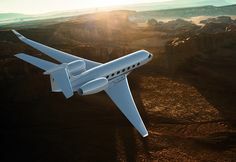 Gulfstream received an order for a G550 special mission aircraft from the German Aerospace Center (DLR) on February 16. The aircraft, dubbed HALO (High-Altitude and LOng-range), will be extensively modified for use in conducting high-altitude research. HALO is expected to deliver to the DLR in 2008. Most recently, on March 11, Gulfstream delivered an ultra-long-range GV aircraft to the National Center for Atmospheric Research (NCAR). The aircraft – known as the High-performance, Instrumented Airborne Platform for Environmental Research (HIAPER) – is being used by environmental and atmospheric scientists from both public and private research facilities. The GV was chosen by NCAR for its exceptionally high-cruising altitude, long range, endurance, payload, reliability and low operating costs, as well as Gulfstream’s consistently high level of award-winning, worldwide product support. The two industry teams that developed the GV and G550 each were recognized with a Robert J. Collier Trophy, the most prestigious aviation award in the United States. The National Aeronautics Association chose the teams – first in 1997 and again in 2003 – for the technological advancements achieved in the development of the GV and the G550. More than 160 government and special mission Gulfstream aircraft are in service, in completions or on order with 34 nations in a variety of roles including executive transportation, photo reconnaissance, maritime surveillance, medical evacuation, weather research and astronaut training. The robust construction, versatility and reliability of the Gulfstream V and the Gulfstream GIV/GIV-SP make them highly desirable for use as special mission aircraft. For example, a GIV-SP is used as a hurricane tracker for the U.S. National Oceanic and Atmospheric Administration (NOAA). The large cabin and efficient short-field takeoff performance of the GV and the GIV/GIV-SP also make them popular for medical evacuations. Gulfstream Aerospace Corporation , a wholly owned subsidiary of General Dynamics (NYSE: GD), designs, develops, manufactures, markets, services and supports the world’s most technologically advanced business jet aircraft. Gulfstream has produced more than 1,400 aircraft for customers around the world since 1958. To meet the diverse transportation needs of the future, Gulfstream offers a comprehensive fleet of aircraft, comprising the mid-cabin, high-speed Gulfstream G100 ™; the wide-cabin, high-speed Gulfstream G150 ™; the large-cabin, mid-range Gulfstream G200 ™; the large-cabin, mid-range Gulfstream G350 ™; the large-cabin, long-range G450 ™; the large-cabin, ultra-long-range Gulfstream G500 ™ and the large-cabin, ultra-long-range Gulfstream G550 ™. Gulfstream also offers aircraft ownership services via Gulfstream Financial Services Division and Gulfstream Pre-Owned Aircraft Sales ®. The company employs more than 6,750 people at seven major locations. We invite you to visit our Web site for more information and photos of Gulfstream aircraft at www.gulfstream.com.